Multi award winning Ocean Rafting has been entered into the coveted Ecotourism Australia Hall of Fame for being continuously certified for 20 years or longer at the recent Global Eco Conference in Townsville. There were only 14 operators Australia-wide who have been acknowledged with this achievement, with Ocean Rafting being the only one in the Whitsundays. As one of the nation’s first ecotourism innovators, Ocean Rafting has helped to pave the way for responsible and sustainable tourism. In 1997, there were just eighteen certified operators, certified under the National Ecotourism Accreditation Program (NEAP) – the world’s first ecotourism accreditation program. Today there are close to 500 certified operators, and the program is still one of only five worldwide that carries Global Sustainable Tourism Council accreditation, meaning it meets a global best practice standard. 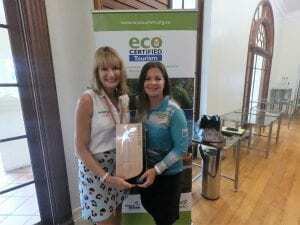 Ocean Rafting owner Jan Claxton and Environmental Manager, Sarah Vickery, attended the Global Eco Conference, where they were presented with an award and certificate to recognise Ocean Rafting’s commitment to ecotourism over the last 20 years. In addition to receiving the award on stage, Jan and Sarah were also invited to be part of the expert panel to share Ocean Rafting’s experience and long-term dedication to responsible and sustainable tourism. Jan was proud of the company’s achievements and the whole team’s effort in sharing their passion for the environment. “Our entire team are proud ambassadors for environmentally responsible, ethical, educational and sustainable tourism and feel strongly about their duty in protecting the future of the Great Barrier Reef, adopting environmentally friendly practices into everyday operations. Having received acknowledgment as only one of 14 operators Australia-wide makes us feel very proud to have played a role in doing the best we can on a daily basis to protect the very special environment in which we operate,” said Jan.
A contingent of 11 Ocean Rafting staff came together on their day off last Friday, taking one of the vessels from the fleet, “Wild Thing” on an exploratory clean up trip to Thomas Island. Cleaning two south-easterly facing beaches over a period of four hours, the team collected 25 extra large bags of rubbish, as well as many bigger items including a man-made toilet, large plastic buckets, 20 litre plastic drums, mooring balls and lines, structural boat plastic and large plastic sheets. Bottle caps were a significant problem, as well as toothbrushes, plastic bottles, small white medicine bottles and plenty of micro plastic. The Ocean Rafting team are passionate about their duty in protecting the future of the Great Barrier Reef, adopting environmentally friendly practices into everyday operations and participating in GBRMPA’s Eye of the Reef program, with crew reporting sightings and conducting monitoring once a week at two different snorkel sites as well as sites less frequently visited. 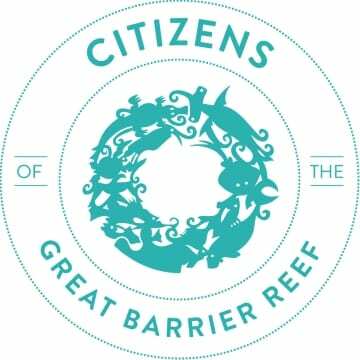 Ocean Rafting is also a proud member of the “Citizens of the Great Barrier Reef” campaign and has also signed up to go plastic straw-free through The Last Straw campaign. Ocean Rafting holds Advanced Ecotourism Certification, is a Green Travel Leader and a Climate Action Business. As an Advanced Ecotourism Operator, Ocean Rafting has been accepted as a GBRMPA High Standard Tourism Operator and is only one of 10 companies Australia wide who has been have been certified for 20 years or more. 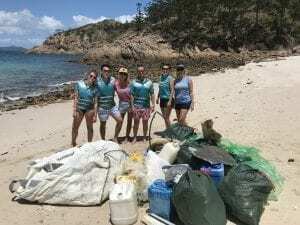 To check out the video the crew made of the day, check out Ocean Rafting’s Facebook page www.facebook.com/oceanrafting and share it around to help remind people to minimise their plastic waste where ever possible. Every little bit helps. Ocean Rafting’s latest addition to the family! Ocean Rafting has welcomed its newest vessel, bringing the total number of vessels in the popular tour operator’s fleet to seven. Following in the tradition of naming all vessels after well-known songs, the latest addition to the fleet has been named “Black Betty”. The custom-built vessels are specifically designed and suited to the operations and the environment in which they operate and the company’s signature adrenalin ride. Increasing Ocean Rafting’s fleet to seven vessels offers an additional capacity of 32 guests, bringing the total number of guests Ocean Rafting can now carry up to 206 daily. Owner Peter Claxton said, “It was just a natural progression for us as we needed more availability and flexibility in rotating the vessels for the maintenance schedule. After 20 years in operation we are continuing to grow and bring new products and packages to the market. Because we own a range of permits with special permissions, our vessels can visit amazing snorkelling sites, as well as offering the ultimate access inside Hill Inlet. 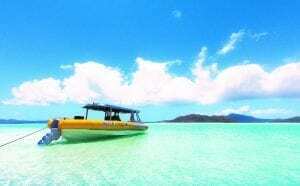 Visitors to the Whitsundays and locals alike have access to an exciting new package, the “Fly and Raft”, with tours commencing this Monday in perfect timing for the school holidays. Guests will enjoy the best of the Whitsunday Islands and Great Barrier Reef in one day with a Whitsunday scenic flight and Ocean Rafting adventure, experiencing the Whitsundays’ ultimate destinations including Heart Reef, Whitehaven Beach, Hill Inlet and secret snorkelling locations. Viewing the Whitsundays from above, the package offers a stunning 60 minute scenic flight over the islands and Great Barrier Reef, including famous Heart Reef and Whitehaven Beach, then a fun day out on the tropical waters on Ocean Rafting’s Southern Lights or Northern Exposure tour. Guests will have a bird’s eye view of many of the 74 Whitsunday Islands, flying over Whitehaven Beach and picture postcard Hill Inlet before heading out to the Great Barrier Reef and experiencing one of the most photographed reef locations, Heart Reef. The comfortable fixed wing aircraft offers big window viewing, pilot commentary and the best views of the Whitsundays. Following the flight, the adventure continues with an Ocean Rafting tour offering three days in one, including an exhilarating ride to Whitehaven Beach and Hill Inlet, pristine snorkelling reefs and guided Whitsunday Island National Parks walks. The Southern Lights tour offers more beach time and the Northern Exposure tour offers more snorkelling time. 60 minute scenic flights stand alone over the Whitsunday Islands and Great Barrier Reef, including Heart Reef, Whitehaven Beach and Hill Inlet are also available. Now in its 21st year of operations, Ocean Rafting is also expecting the company’s seventh custom built vessel to arrive in the Whitsundays any day, which will complement the existing tours as well as the new Fly and Raft package. Multi award winning Ocean Rafting has also won the Major Tour and Transport Operator award at the Australian, Queensland and Whitsunday Tourism Awards for the past two years in a row. 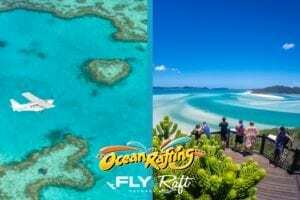 Ocean Rafting already offers the ultimate access to Hill Inlet and Whitehaven Beach on their daily Northern Exposure and Southern Lights tours and this new package will showcase even more of the Whitsundays’ iconic destinations, offering the best view from above, on and below the water! Ocean Rafting achieved national success at the 2017 Australian Tourism Awards in Perth on Friday night, winning the gold award for Major Tour and Transport Operator. It is the second year in a row Ocean Rafting has won this highly contested category on an Australian level and follows recent success in the same category at both the Whitsunday and Queensland Tourism Awards. Nationally, the category had strong competition from six other finalists at the 2017 Australian Tourism Awards, who had each also won the category in their relevant state awards. “We are so incredibly proud of this award, particularly after winning it two years in a row on a national level. As a team, we are consistently working hard to always be innovative and improve the operation and we will continue to invest in the business going forward,” said Peter. It has been a big year of growth for Ocean Rafting, with the arrival of a sixth vessel, the order of a seventh vessel and the company’s recent 20th birthday celebrations in October. “We operate in the one of the most beautiful places in the world, the Whitsundays, and given our special permits, we have the opportunity to showcase one of Australia’s most iconic beaches, Whitehaven Beach and Hill Inlet, on a daily basis. Last year was definitely challenging due to the impacts of Cyclone Debbie on our natural environment, but the region has certainly bounced back and is returning to its former glory,” Peter said. Abell Point Marina North (next to Sorrento Restaurant & Bar), Airlie Beach, QLD, 4802, Australia.